Realtor.com operator Move Inc.’s subsidiary, ListHub, is set to stop sending listings to realtor.com rival Zillow in 90 days, potentially cutting off the flow of hundreds of thousands of listings to the most highly-trafficked real estate portal on the Web. But Zillow — which says an agreement with ListHub dating back to 2011 is set to expire on April 7 and will not be renewed — is positioning itself to get more listings directly from multiple listing services and brokers. Zillow today announced the launch of a new “Data Dashboard,” a listing management and reporting platform that the company says puts more control over listings in the hands of MLS members and brokers. Zillow said it’s already receiving direct feeds from “dozens of MLSs” and 4,000 brokers. By the time the ListHub agreement expires, the company expects to have the vast majority of its listings — at least 1.6 million of the 1.8 million for-sale listings on its site — transmitted through the Zillow Data Dashboard directly from MLSs and brokers. Eventually, the company anticipates all listings published on Zillow to come through the dashboard. Zillow’s agreement with ListHub dates back to April 2011 and has a 48-month term. The agreement was set to renew automatically for additional one-year terms unless canceled by either party with 90 days prior notice, according to a Zillow regulatory filing published today by the Securities and Exchange Commission. There’s long been speculation that ListHub — which is owned by realtor.com operator Move Inc. — might cut off the flow of listings to rival sites like Zillow and Trulia. In the past, Move CEO Steve Berkowitz has said cutting off the flow of listings to other sites would not be in the best interests of ListHub’s broker and agent clients. But Move was acquired by Rupert Murdoch’s News Corp. in November, and Berkowitz was scheduled to hand over the company’s reins this week to News Corp. veteran Ryan O’Hara. “We’ve not been able to come to terms with News Corp.” over renewing the ListHub agreement, Zillow Chief Revenue Officer Greg Schwartz said today. “The ListHub agreement will most definitely expire” in April, he said. He declined to elaborate further on negotiations between the two companies. Move Inc. did not immediately respond to a request for comment. “A few hundred thousand listings” of the 3.6 million currently displayed on Zillow would be disrupted if the ListHub contract ended today, said Zillow spokeswoman Katie Curnutte. Zillow displays for-sale-by-agent, for-sale-by-owner, pre-foreclosure, new construction and rental listings, among others. Because many of Zillow’s MLS partners are located in big urban areas, Curnutte anticipates that rural areas will be more affected by the change. Schwartz was optimistic about obtaining direct feeds for those listings. “I think we’ll be able to solve this one pretty quickly. We’re going to have a lot of connections over the coming months,” he said. Whether or not that’s true may hinge on the appeal of Zillow’s free Data Dashboard for brokers and MLSs. The platform will become available to all MLSs and brokers sending direct feeds to Zillow in mid-January. Boise, Idaho-based Intermountain MLS is currently beta-testing the dashboard and implementations are in the works for Florida’s largest MLS, My Florida Regional MLS; Northeast Oklahoma Real Estate Services (NORES), which is operated by the the Greater Tulsa Association of Realtors; and Northern Nevada Regional MLS. Detail of presentation promoting the Zillow Data Dashboard. “As we enter a new year, we are cementing our commitment to be the best industry partner to the MLSs and brokers who send listings to Zillow,” Schwartz said in a statement. 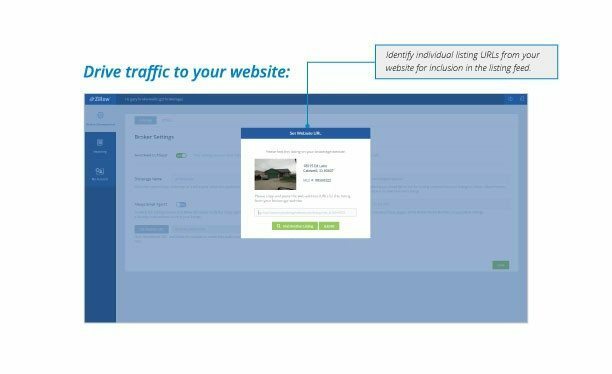 The Zillow Data Dashboard will allow brokers to opt-in or out of sending their listings to Zillow with one click; keep customized MLS fields; and automatically update their listings every 15 minutes. Through the dashboard, brokers will also be able to set lead routing rules; include links to individual listing pages on their website; and get free daily reports of listing performance metrics such as search result impressions, total listing views, and total leads delivered. MLSs and brokers will also benefit from customer support staff available daily, Schwartz said. Often, MLSs are charged with finding out what a listing is not showing up where a broker or agent wants it to, he said. “MLSs get trapped in between this lost listing. In the rare instance when that happens … we’ll go ahead and staff it and resolve it really quickly,” he said. Brokers will be able to access the dashboard through either a URL sent by their MLS, or for those whose MLSs have this option, via a single-sign on interface from real estate tech firm Clareity Security. In order for brokers to access the dashboard, MLSs must choose to implement it. Some MLSs have their own listing management dashboards and may choose to use those instead, Schwartz said. The dashboard doesn’t currently allow brokers to opt-in or out of sending their listings to Zillow on a listing-by-listing basis, but Schwartz said that it would not be too difficult to add that capability if it were requested often. Zillow plans to provide agents access to the dashboard sometime in the first quarter, Schwartz said. MLSs that already send Zillow direct feeds include Silicon Valley-based MLSListings Inc., the New Jersey MLS, the Houston Association of Realtors and the Northern Alabama MLS. Metropolitan Regional Information Services Inc., an MLS serving 40,000 members in the Mid-Atlantic region, is one MLS that currently shares its listings with Zillow through ListHub with broker approval. In the absence of a Zillow-ListHub agreement, Zillow will have to form a relationship directly with MRIS or its brokers to get listings, MRIS CEO and president David Charon told Inman. “This should not be a surprise to most MLSs as the issue has been front and center for quite a few months,” Charron said. With Zillow reliant on its competitor for a bulk of its listings, commonsense suggested that it was working on developing a workaround, Charron added. “Direct feeds from MLS is the most obvious answer plus they can parlay their acquisition of Retsly,” Charron said. Zillow acquired Retsly, a platform that streamlines access to MLS data for real estate technology developers, in July. Howard “Hoby” Hanna, an exec at one of the largest brokerages in the U.S., Howard Hanna Real Estate Services, said the end of the Zillow-ListHub relationship could disproportionately affect smaller brokerages who don’t have the technology to syndicate their listings themselves. Howard Hanna began sending a direct feed to Zillow and other third-party sites six years ago because the brokerage wanted to have total control of how its listings were distributed and to better monitor its marketing spend, Hanna said. Like Charron, Hanna said he gets the feeling that brokers want to take back control of distributing their listings to portals. He also was not surprised at the news. News Corp. is known to be competitive, he said, and as such why would it want to make it easier for one of its largest competitors to get listings? Like many in the industry at large, Hanna said he’s intrigued to watch how the two media heavyweights make moves and countermoves in efforts to get an upper hand on each other over the course of 2015. Editor’s note: This story has been updated. Inman News reporter Paul Hagey contributed reporting.